What's killing the birch trees? You may notice some trees missing when you stroll around campus this fall. This summer’s sustained heat coupled with the crafty work of the bronze birch borer have weakened the University of Washington’s birch trees, forcing grounds crews to remove many of them. Many campus birch trees will be removed due to the bronze birch borer. Adult beetles are slender, dark, iridescent and greenish-bronze, about 10 mm long. The bronze birch borer beetle has become a serious pest in our state. Despite gardeners’ efforts to maintain deep, regular watering and fertilization, our recent hot, dry summers have allowed this wood-boring beetle to lay its eggs in the bark of a host tree. After several weeks, the larvae emerge and tunnel their way in, and this constant maze cuts off food and water supplies to the trees. UW arborist Sara Shores says the destruction is worse than in past years. “They settle inside the tree and essentially eat away at it for two years and mature before we see any damage, and since birch trees are fairly delicate, by then the damage is irreversible,” Shores says. The tell-tale sign of a dying birch tree is the wilting and dying of foliage from the crown, or top of the tree, along with D-shaped insect exit holes in the bark. Once these symptoms are visible, the tree will continue to decline, even if treated. Damaged birch trees pose a hazard because they are susceptible to dropping branches. Removing the tree also removes the existing larvae, therefore preventing further damage to nearby birches, Shore adds. UW Facilities’ Grounds Management team has treated 51 trees this year as a pilot program and removed 14 of them. They assessed 245 and chose the specimens most likely to survive due to health and lack of symptoms. Forty-five birch trees are slated for removal. Whenever possible, the UW turns campus trees into furniture through its salvage wood program, but the larvae found in the wood mean the trees must be processed or disposed of. “We chip everything we can and then Cedar Grove hauls away the large pieces and turn them into compost,” she adds. The UW is not alone in its declining birch trees. The pest is ubiquitous in Seattle and you may notice birch trees in your own neighborhood that show similar signs. Statistics from other cities show a loss of approximately 70 percent of birch trees. 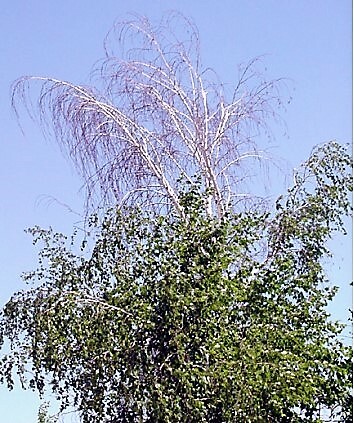 While experts do not recommend planting birch trees in this region anymore, existing trees that receive plenty of water, fertilizer and mulch are most likely to survive, as are those planted in cool, moist, shaded areas.